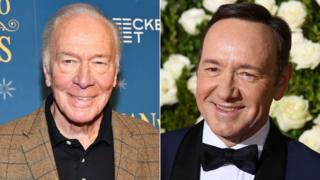 Christopher Plummer has been nominated for a Golden Globe for the role in which he replaced Kevin Spacey. The actor took over the role in All the Money in the World after a string of sexual harassment allegations were made against Spacey. The Shape of Water received the most nominations of any film - with seven in total. The Post and Three Billboards each have six. But another film in which Spacey stars, Baby Driver, attracted one nomination - Ansel Elgort is up for best actor in a musical or comedy film. Gary Oldman is nominated for best actor in a drama, for playing Winston Churchill in Darkest Hour - the film's only nod. Oldman faces competition from Timothee Chalamet (for Call Me By Your Name), Daniel Day-Lewis (Phantom Thread), Tom Hanks (The Post) and Denzel Washington (Roman J Israel, Esq). Angelina Jolie gets a nomination in the best foreign language film category for her Cambodia-set drama First They Killed My Father. Her competition includes Palme d'Or winner The Square, an art world satire from Sweden that won six prizes at Saturday's European Film Awards. The show received six nominations in total - making it the most-nominated TV series this year. The pair are up against Jessica Biel, who is nominated for her role in The Sinner, and Jessica Lange and Susan Sarandon, both of whom are nominated for Feud: Bette and Joan. The category is completed by Ewan McGregor, who is nominated for Fargo, and Kyle MacLachlan, for Twin Peaks. The 75th annual Golden Globe Awards, hosted by US comedian Seth Meyers, will take place on 7 January.